I am SO ready for the Spring and I can’t wait to start working in my garden. I know it’s February, but you can start prepping your garden and patio space on some of the warmer/mild temperature days. Today, I’m sharing How to Easily Get Your Outdoor Furniture & Gardening Planters Ready for the Spring. 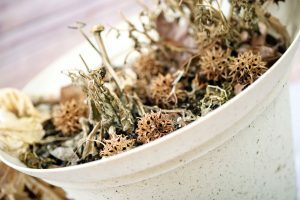 If you’re like me, you probably have a lot of dirty planters laying around and you’re ready to dust off your patio furniture! 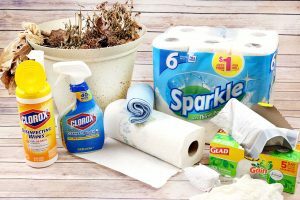 Dollar General makes it easy to pick up all of the supplies you need, including Clorox, Georgia-Pacific and Henkel products and is offering a Spend $15, Save $5 deal right now! 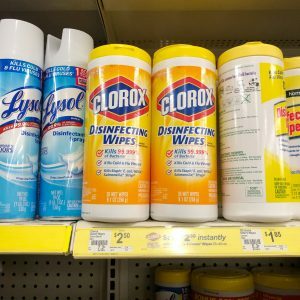 First, I stopped by my local Dollar General and picked up my favorite Clorox, Henkel and Georgia-Pacific products. 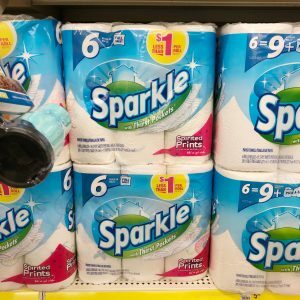 I picked up Sparkle® Paper Towels and Glad® Trash Bags. 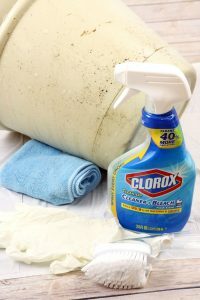 Clorox® Disinfecting Wipes and Clorox® Clean-up® Cleaner with Bleach. 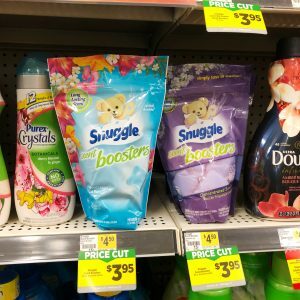 I also picked up Snuggle® Scent Boosters, which I’ve been wanting to try. I love that Snuggle keeps your clothes ‘Snuggly soft & Fresh.’ And, who doesn’t multitask? I’m always sneaking in a couple loads of laundry everyday in-between my other tasks! Lay a Glad® Trash Bag down under your pot for easy cleanup. First, I’ll remove any dead plants, leaves, etc. 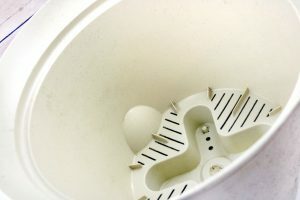 from the surface of the pot. 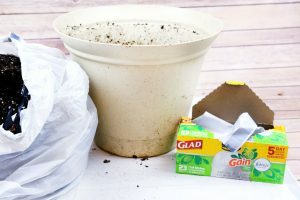 Next, I dump the old potting soil out into another Glad® Trash Bag. I can then move the dirt to another location in the garden, or I can recycle it with some new potting soil before I place it back in the pot. 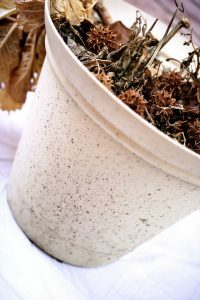 I rinse out all of the old dirt that was inside the pot and wipe it clean. Whenever I work with bleach, I always wear gloves. 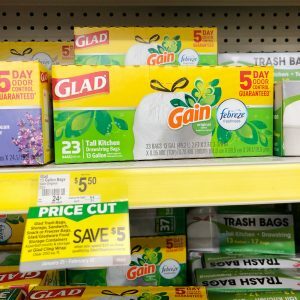 You can pick up some inexpensive working gloves at Dollar General. I also picked up a scrubbing towel and brush for some areas that need a little more work. Spray the entire outside of your pot with the Clorox® Clean-up® Cleaner with Bleach. 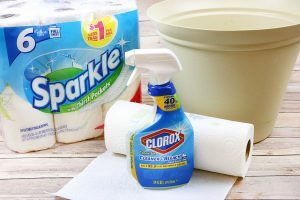 I usually let it soak in for 30 seconds and then I wipe it clean with Sparkle® Paper Towels. I only clean the outside of the pot with the bleach and the inside of the pot with water. Now my gardening planter is clean and ready to be displayed with beautiful flowers this Spring! Given that this is a light colored planter, I am so glad that these products helped make it look like new again! 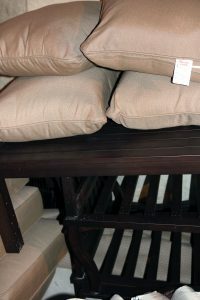 We put all of our outdoor furniture in our basement over the winter season. It’s always still a little dirty from being outside from the past season and it gets dusty while being stored downstairs. 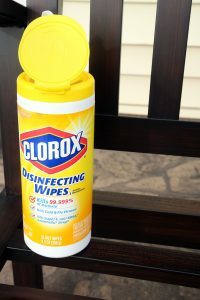 I’ve found that dusting and wiping the furniture down with Clorox® Disinfecting Wipes is a quick way to speed clean them and prepare them for the Spring. 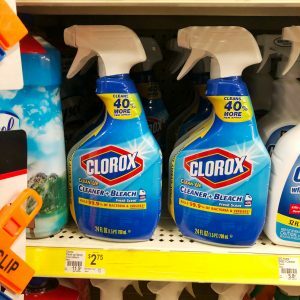 It’s great that Dollar General carries my favorite Clorox, Henkel and Georgia-Pacific products, which I always need to stock up on for the Spring. 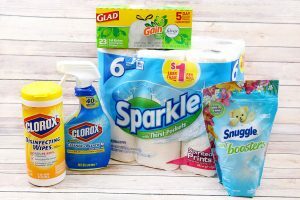 You can now Spend $15, Save $5 on Clorox, Henkel and Georgia-Pacific products at Dollar General. Have you started to prepare your garden for the Spring?